My first race for the second half of the year begins with Shape Run 2016! Shape Run is a special run because it is the first race that I did 2 years ago. I remembered how poorly organised the finisher tee collection was then. It had snaking queues that left a bad impression for me. Fast forward 2 years later, I joined the 10KM race again. The race was held at Bayfront Event Space beside MBS. I reached at 6am for the 6.45am flag off. It was still very quiet when I reached, the 15km runners were just flagged off and there were not many 10KM runners there yet. There was a row of about 15-20 portable loos behind the starting line. However it was blocked by the baggage deposit area thus making it not visible. First race that I woke up late for and ended up in the second wave. Now I know how the wave system functions! I didn’t collect the race pack myself so I can’t comment on collection, but the race pack is actually quite decent with physical sample products. There is one Soyjoy bar, Garnier Men facial wash, Tigerbalm muscle gel, one strip of Acti-Tape, and one running pouch. 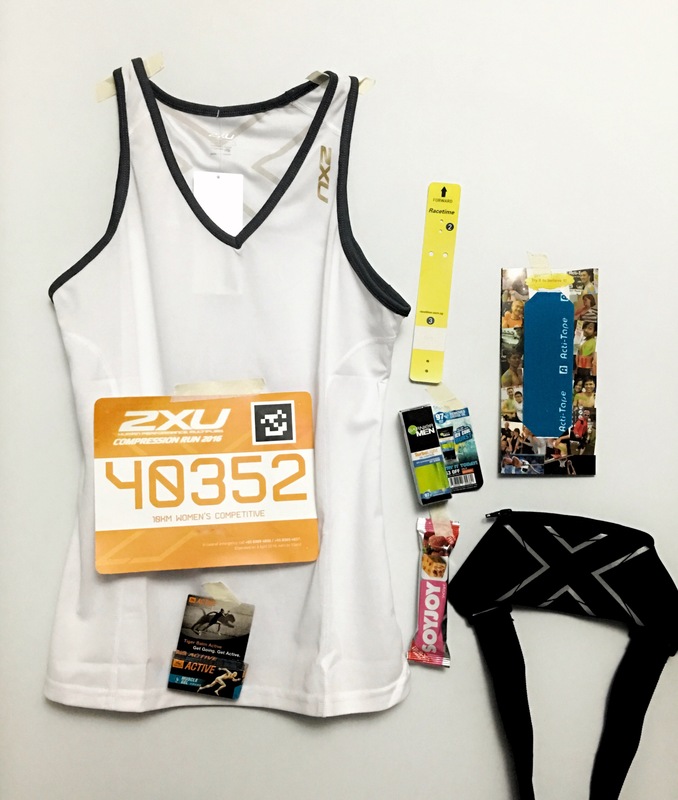 The running tee does not have any logos to indicate that it is for the 2016 2XU Run which I thought was great since some running tees just have too many huge logos everywhere. I did my usual runs as part of my training for the Sundown Marathon, I didn’t particularly train at my 10KM ideal race speed so I was not aiming for a PB. I just thought that it will be a good race since I’m running with a friend. My first wet race! It was raining on and off for the whole day, the air was cold and the ground muddy but it was a new experience for me. I have not been training much since I lazed around during CNY so I tried to sneak in some pre 10 km race training during the week before Saturday. I ran a long run 10km, a tempo with fast finish 5 km and a tempo with fast finish 6 km on the treadmill to mentally prep myself for my race pace. I think that conditioning worked! I felt more ready for the race. My previous 10KM Brooks Run Happy demoralised me a little since I was really aiming for a PB in that race so I target to take it easy for this race. First race of the year done! 10km completed wits a nett time of 1h 06m 15s. Although it’s not a PB, it was a meaningful one because I did it with my Sister. I collected my race pack for Brooks Run Happy over the weekend. It’s really happening, my first race of the year! Collection was at Key Power Sports located at Velocity@Novena Square. There were 2 days, Saturday and Sunday for the race pack collection, and I went on Sunday at around 3pm. I signed up for Brooks Run Happy 10KM as my first run in 2016 and convinced my sister to join me. Yay to running buddies! In order to train for this, I went online and found a sub 60 mins training plan. I though of doing the half marathon option, but since it starts at Big Splash, I have a feeling that the race will be running the East Coast Park route. There is nothing bad about this route, but doing loops around the park can be monotonous and I can do it myself as my long slow distance training.